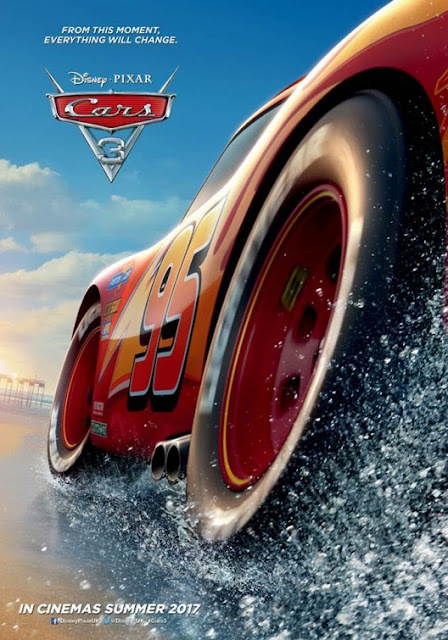 Chrichton's World: Review Cars 3 (2007): Lightning McQueen passes the torch! Review Cars 3 (2007): Lightning McQueen passes the torch! When the teaser trailer was shown in the cinema I was real curious about Cars 3 even when it was the last film I expected to be made. I thought the first two had basically told what they could tell and that they were finished. Let's assume that some filmmakers in Hollywood do care about telling stories and aren't solely driven by greed. But now having seen this I think there was still something left. I am going to share my thoughts on it. Now I have to admit that it took a while for me to actually motivate myself to watch this. A lot of reviews and comments on forums and film review sites had been very rough on Cars 3 and I just wasn't ready to get disappointed. Especially when they claimed that Cars 3 lacked heart. You could say a lot about this third film but not that it lacks heart. That is a blatant lie. Cars 3 very much appeals to the heart but in a way you probably didn't expect. Cars 3 is basically giving us life lessons that could be applied to every individual. You can't stay on top forever. Everybody gets rusty and old. Is there life after that succeslul career? Cars 3 teaches us that some things are unavoidable but that it doesn't automatically your life is less meaningful. As long has you have the fire and passion for something your life will be joyous and fruitful. But it requires self reflection and realization. There is a scene where Lightning thought he knew how his mentor Doc felt to then be told that he was wrong all this time. It's the most emotional moment in the film since it was the the first time the Cars 3 transcended Lightning's story and became an universal moment that everyone can relate to. That to me was far more compelling than the story of Cruz Ramirez becoming the racer she always wanted to be. Don't get me wrong. I liked it but without Lightning passing the torch it would have much less of a dramatic impact on me. In essence Cars 3 is doing what Creed did for Rocky. Was it what I expected and wanted? No. But was it therefore bad? Absolutely not. Cars 3 is just as touching and endearing as the previous films only it does it in a very confronting manner. And you have to be prepared for that.